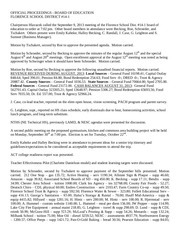 This PDF 1.5 document has been generated by Acrobat PDFMaker 11 for Word / Adobe PDF Library 11.0, and has been sent on pdf-archive.com on 29/05/2015 at 01:12, from IP address 70.194.x.x. The current document download page has been viewed 351 times. File size: 204 KB (29 pages). million, with a state share of $129.9 million. of the $129.9 million shown above plus the $4.8 million of high poverty aid. 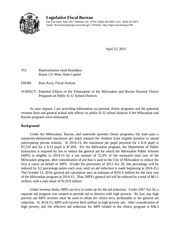 Racine Unified School District (RUSD) is eligible related to the Racine parental choice program. statewide program are estimated to be $7.3 million in that year. possible effects of the elimination of the programs, this memorandum will consider both options. that 0, 25, 50, 75, 90, or 100 percent of choice pupils attend MPS or RUSD. used in Table 1 relating to fully phased-in cost is used in Table 2.
both MPS and RUSD and no additional general school aids funding had been appropriated. an amount equal to the decrease. compared to the scenarios under which additional aid would not have been appropriated. $3.7 million in that year, while RUSD per pupil aid would have increased by nearly $170,000. potential range of effects of an alternative to eliminate the choice programs. I hope this information is helpful. Please contact me if you have further questions. This file has been shared by a user of PDF Archive. Document ID: 00246803.